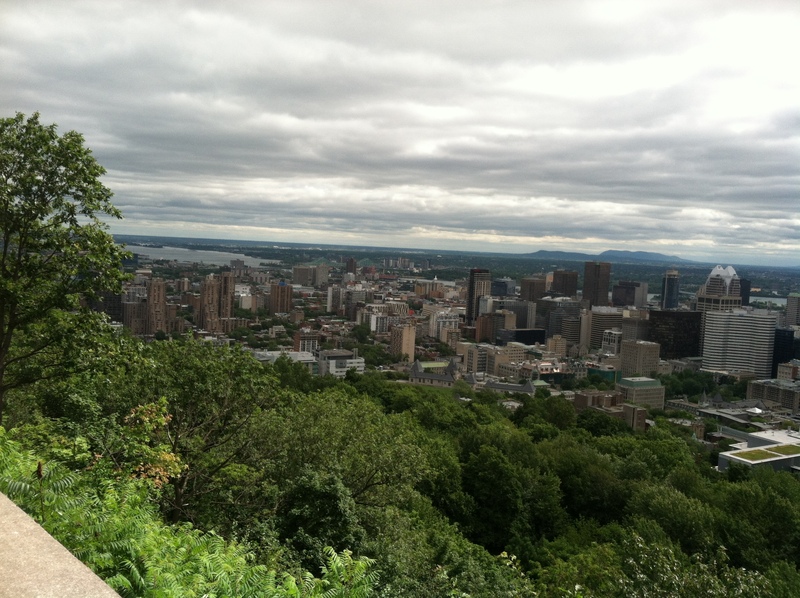 The only place I know offering francophone culture so strongly this side of the Atlantic is in Montreal, Quebec – an island city in the middle of the St. Lawrence River. 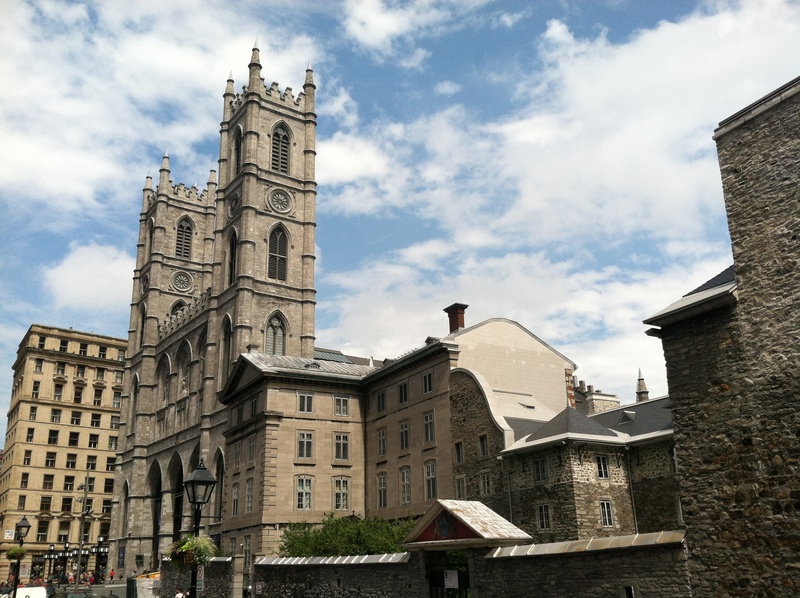 Montreal is a lively, international destination which offers much in history and architecture, arts and culture, festivals and dining. We recently visited the city for a few days and found enough time to explore some of its best spots. 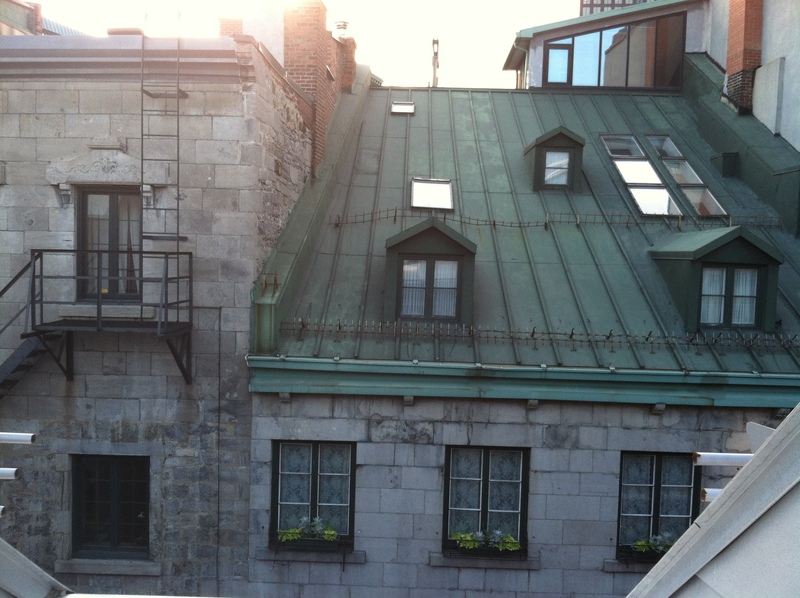 Positive reviews from the NY Times Travel section prompted me to book a medium room at the hip and classy, no-snob boutique hotel, Le Petit Hotel, in Old Montreal. 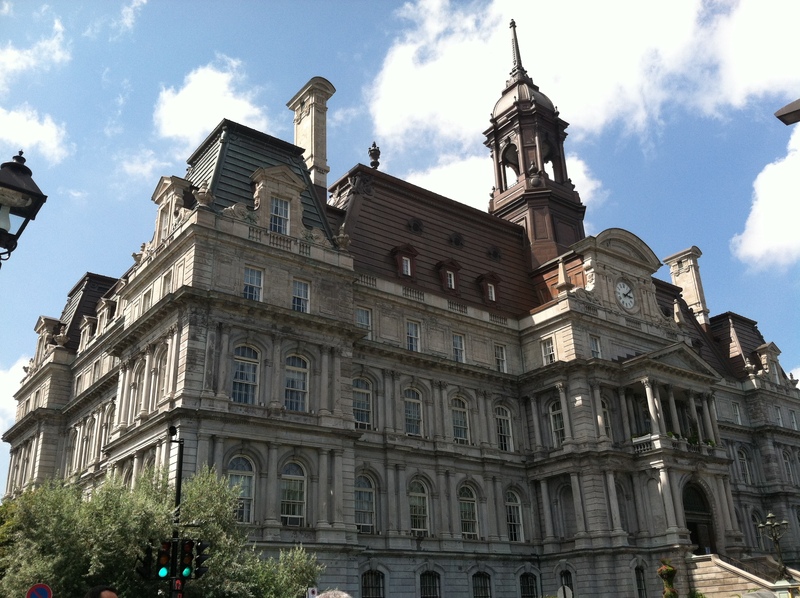 Comprised of only 24 rooms and a lobby café, the hotel is housed in a beautiful 19th Century building on the quieter, more residential side of Rue Saint-Paul Ouest. Its helpful staff provide you with excellent services, and gave us good suggestions during our stay. Tips: Request the well laid-out top floor/street view room and indulge in the (included) delicious breakfast offerings, especially the pain au chocolat and perfectly-brewed cappuccino. Online promotions are available and business travelers can receive room discounts. 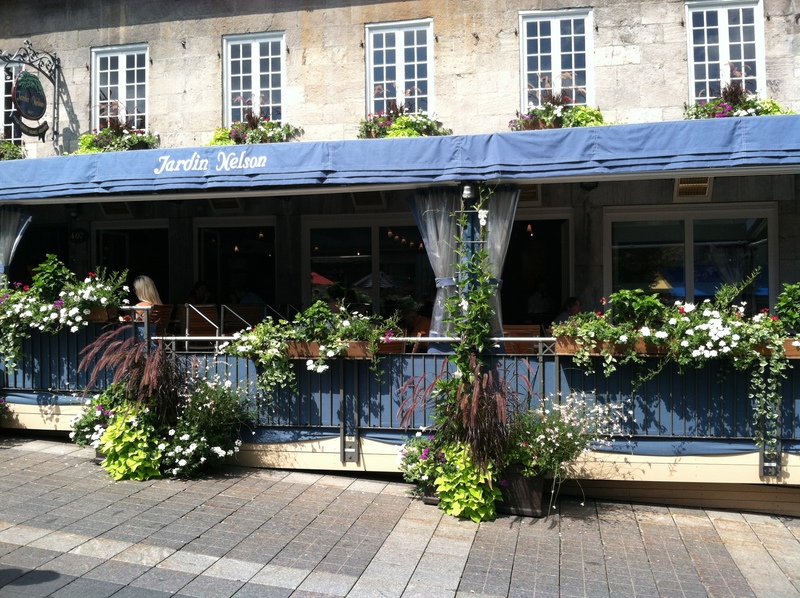 Hands down, our favorite dinner experienced in Montreal was at the fashionable Restaurant Holder on Rue McGill (order the veal or salmon), thanks to a tip by our hotel staff. I’m told you also can’t go wrong with lunch at the busy but delicious Olive and Gourmando if you can handle the crowds (we couldn’t wait). 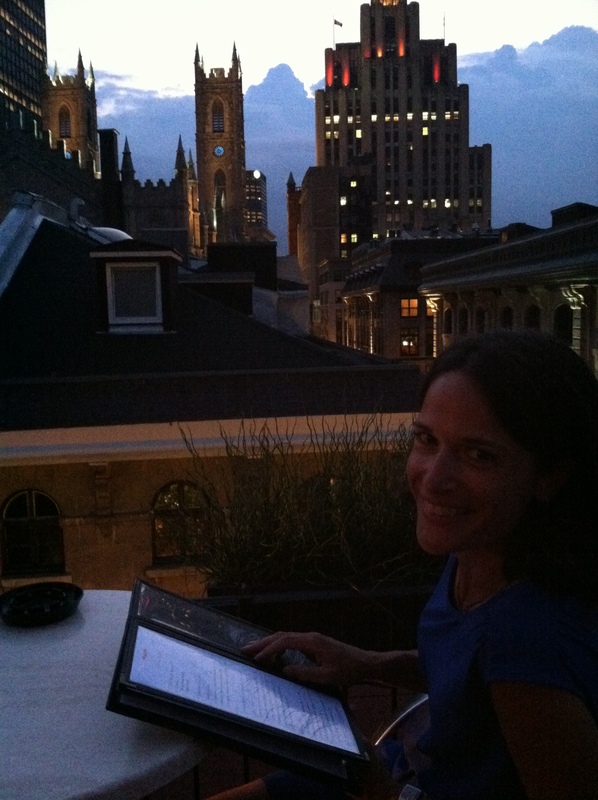 You can’t leave Old Montreal without experiencing an evening drink on a rooftop terrace. The rooftop terrace at Hotel Nelligan on Rue St Paul is a perfect place to enjoy a glass of wine at sunset with views of Notre Dame. Get there by 9 pm if you want to snag a table. Just look out for the characteristic Eastern Canadian summer thunderstorms, as we experienced a downpour minutes after this picture was taken. 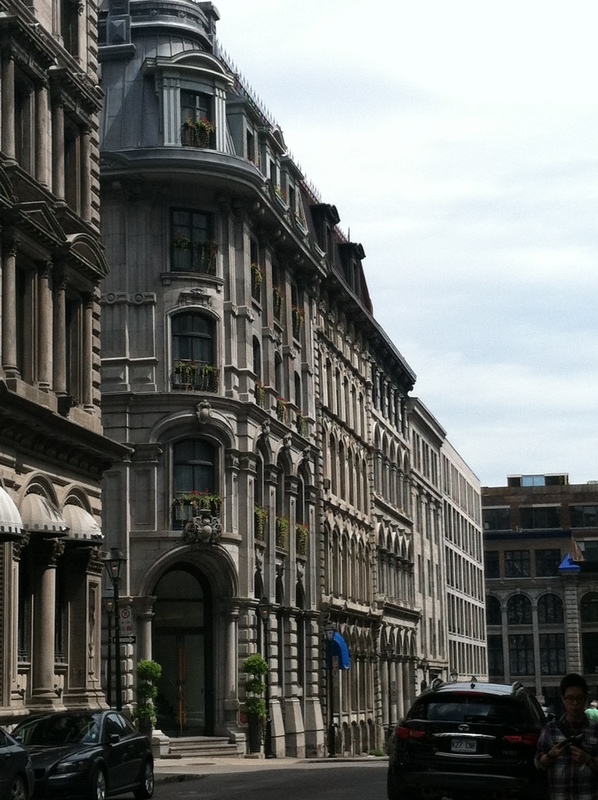 If you stay in Old Montreal, there is no better place to walk the streets – or get lost – and soak in its history and architecture. Make sure you look up. 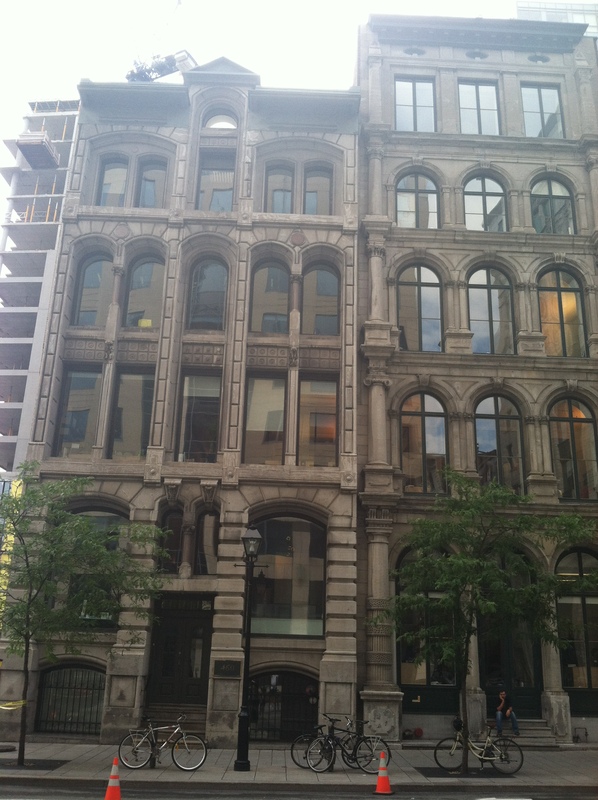 Like in Europe, some of the best architectural details of a building are found in the direction of the sky. One of my favorite buildings is the Royal Bank of Canada building, where my mother worked in the early 1960s. 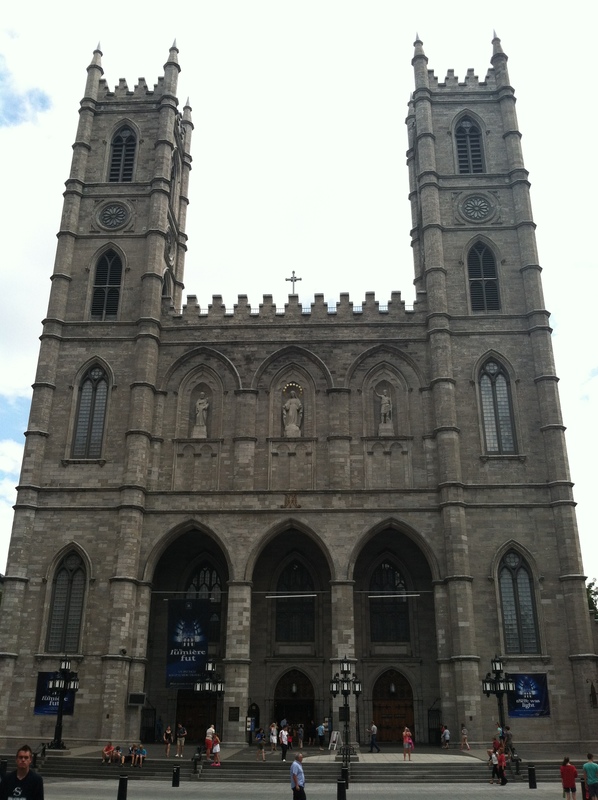 In fact, I can proudly thank the influence of Montreal on my mother – and her bank teller friend – for my French name. 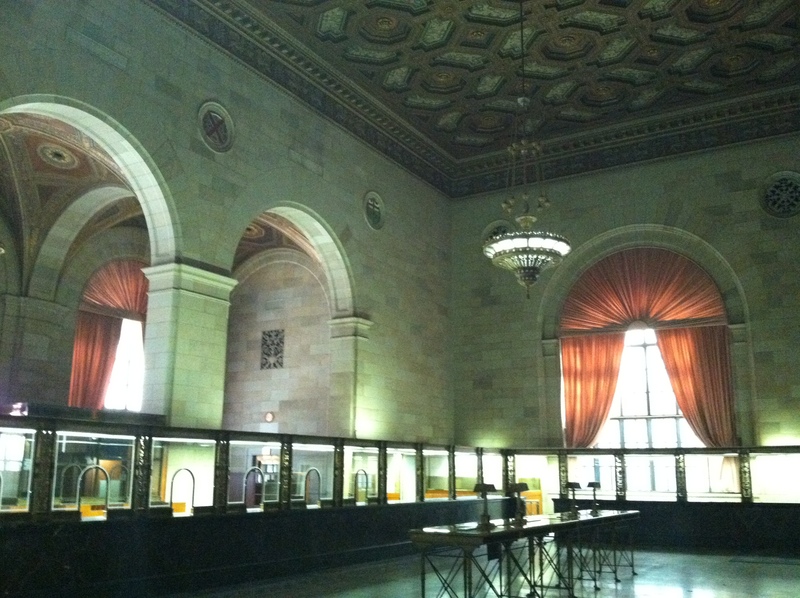 Banking ceased only about a year ago. The inside of the building and the ceilings are breathtaking. 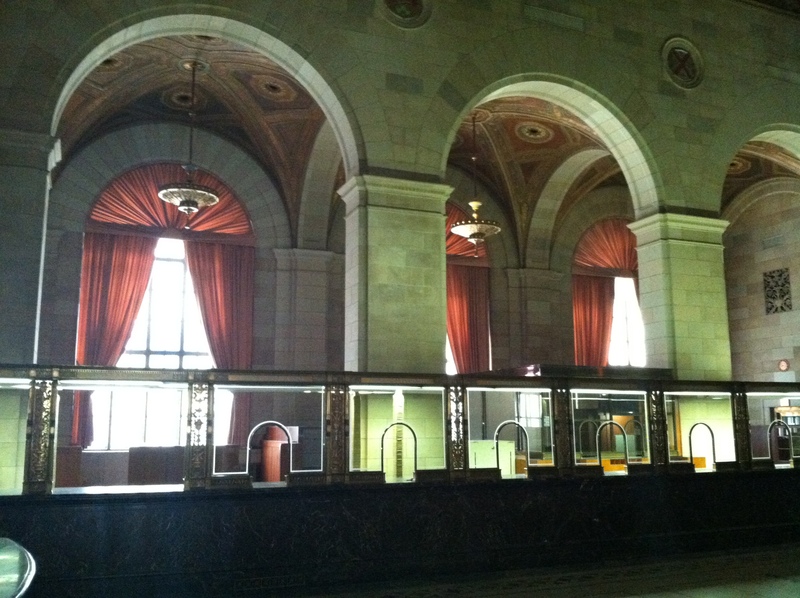 Inside the Royal Bank of Canada building. 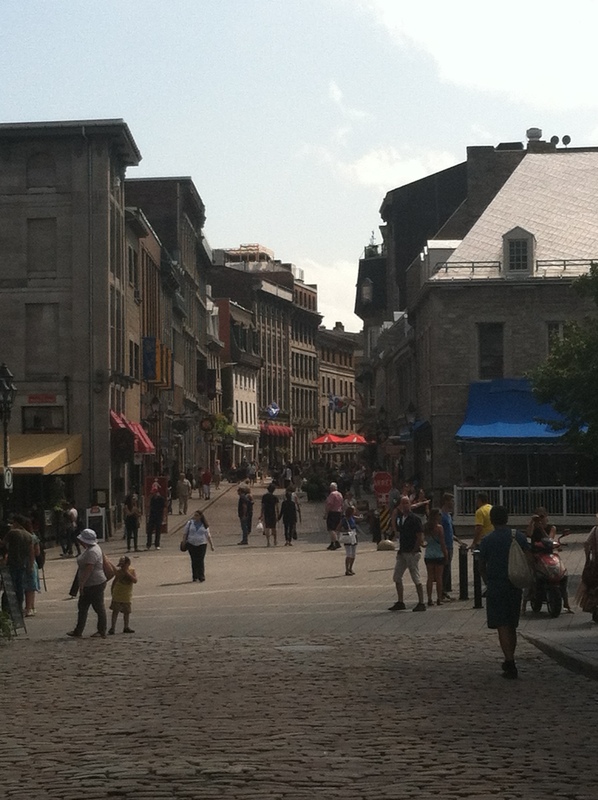 Notre Dame is a centerpiece of the old city. 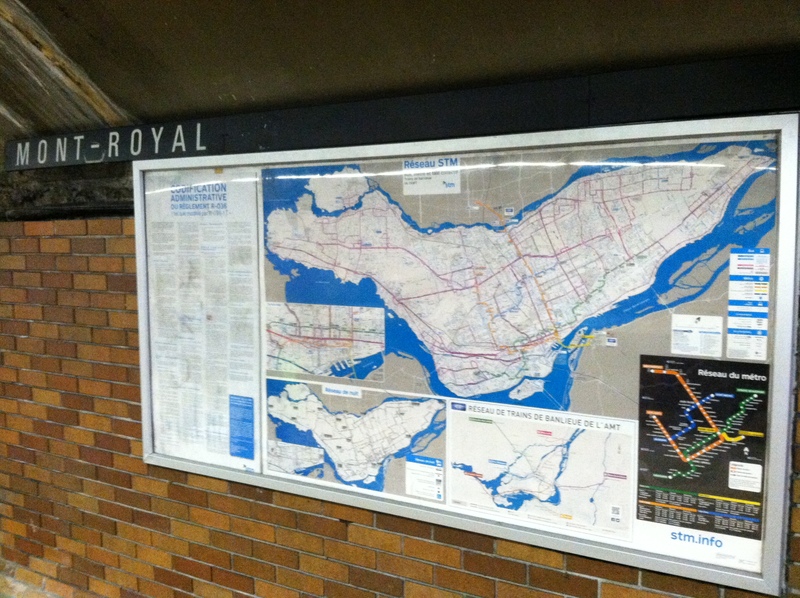 To get further out to fashionable neighborhoods like the Plateau, grab a metro map and a day pass (9 Canadian dollars). Or you can rent a Bixi Bike – the public bike share system – to ride along the old Port and a grab a view of architectural landmark Habitat 67, a model community and housing complex designed by Israeli–Canadian architect Moshe Safdie for the World Fair in 1967. 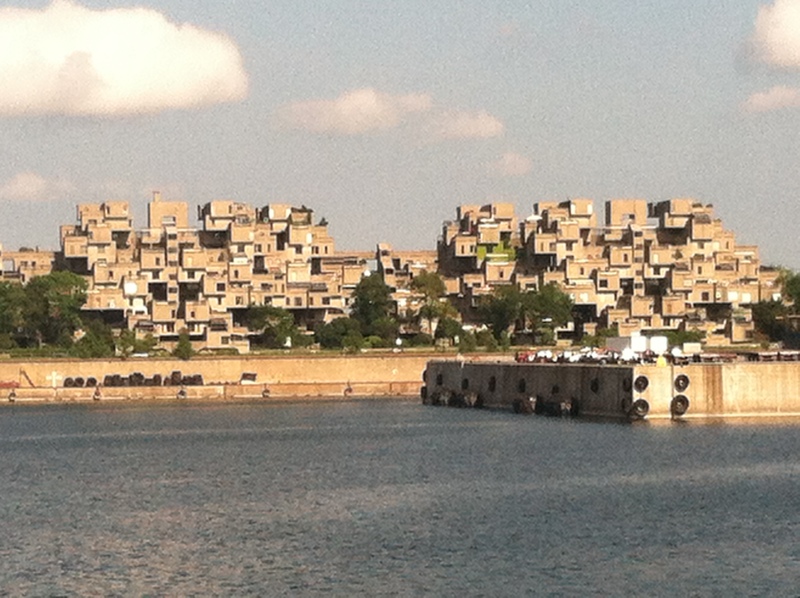 If you are ambitious, you can get a closer look at Habitat 67 and other architectural icons like Biosphere by riding your bikes from Old Port to Parc Jean-Drapeau. Don’t repeat our mistake by aborting an attempt to reach the island via the Jacques Cartier Bridge, which looked shorter in distance from Old Port than it was. Instead ride the opposite direction on the bicycle parkway. This would be done best with a day bike rental, as opposed to a Bixi Bike, which charges you if you exceed a 30-minute time usage period. 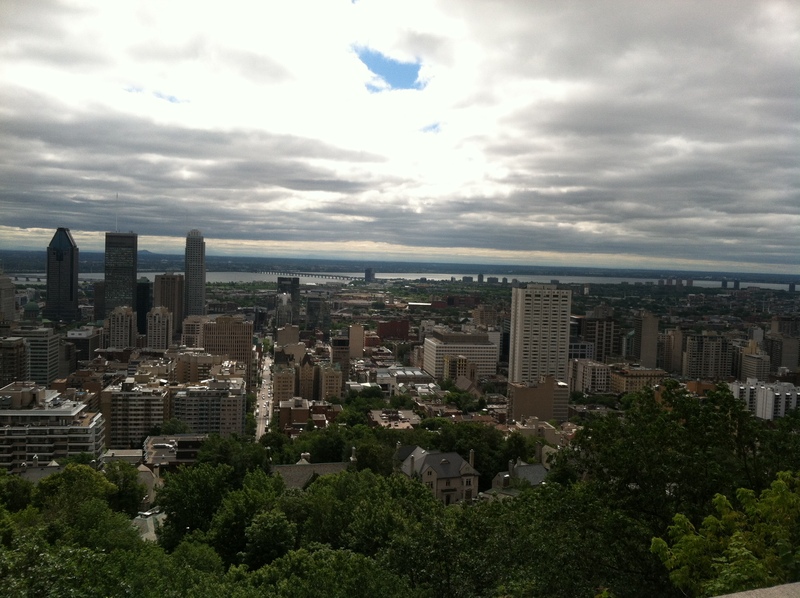 A hike up Mont Royal is lovely and a good way to walk off those morning pain au chocolats and rooftop terrace drinks, and the view at the top is a nice reward. You can grab the #11 city bus back down to deliver you to Avenue Mont Royal, where you can find a metro station back to Old Montreal or wherever else you’d like to go. The permanent collection at Montreal’s Musee des Beaux Arts is always free. Please note special exhibitions are not, but on Wednesday nights tickets are half off. 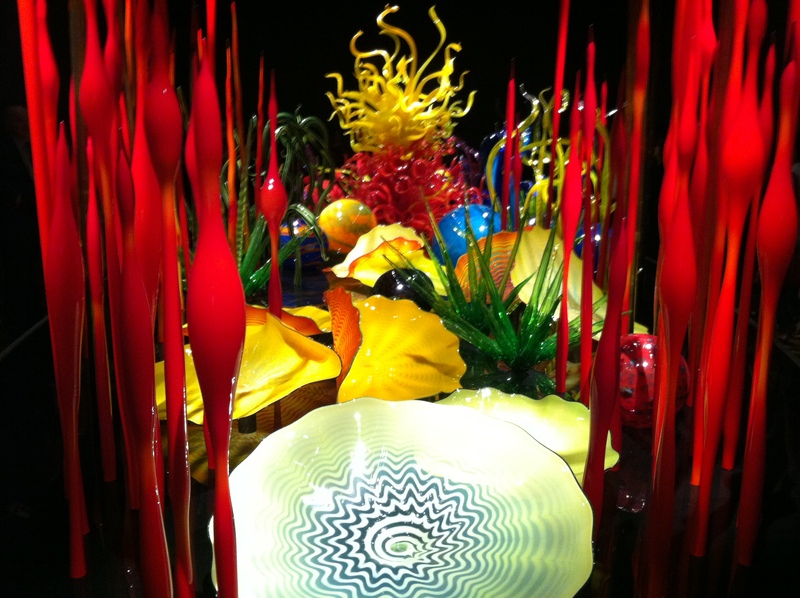 We visited the Museum’s current exhibit, “Utterly Breathtaking” featuring Dale Chihuly’s large-scale, nature-inspired blown glass. 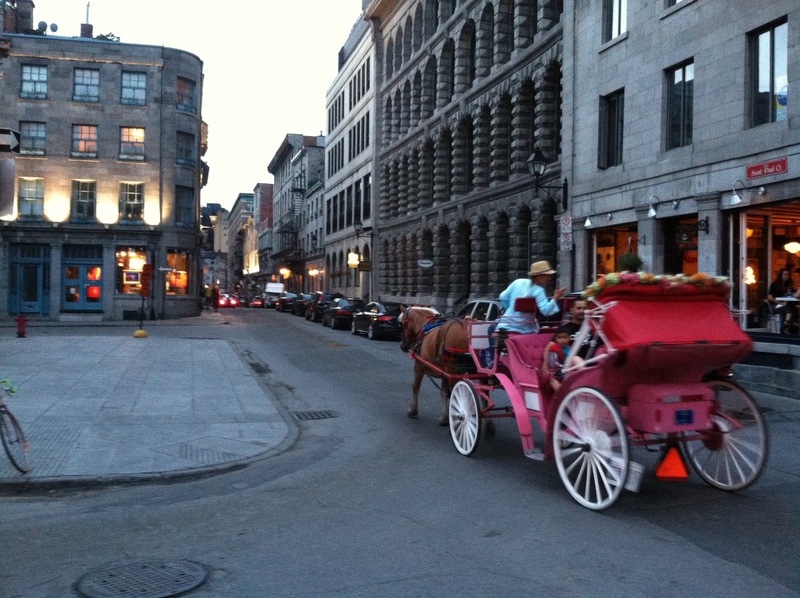 While below the city surface, Francophone/Anglophone tensions are nothing to laugh at (unless you are Sugar Sammy, see my past post here), visiting Montreal offers travelers a uniquely bilingual, culture-rich experience in a place well-deserving of its lively reputation. Its residents seem to have a less- North American, more-European sense of enjoyment of life and leisure and we’re glad we caught some of it there too.